VATICAN CITY (CNS) — Despite holding the world record in the high jump, Javier Sotomayor kept his feet on the ground and didn’t try to clear the waist-high wooden barricade between him and Pope Francis. 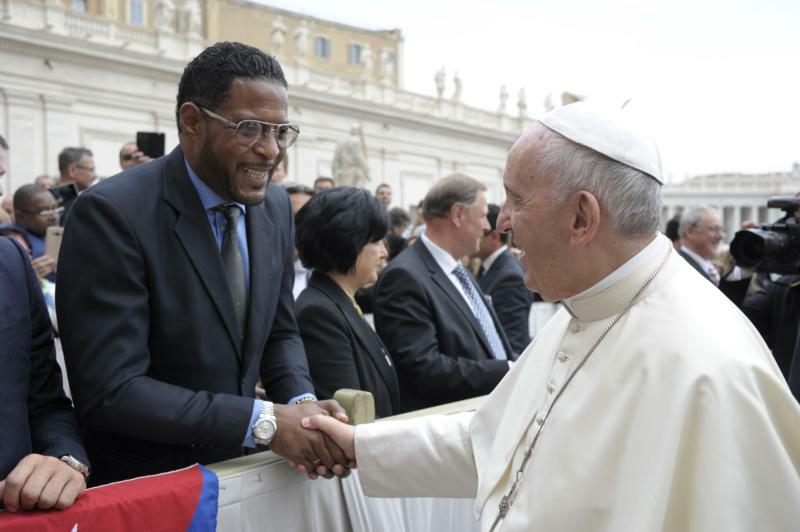 The now-retired 50-year old Cuban track-and-fielder was part of a small athletic delegation from Cuba greeting the pope at the end of his May 2 general audience in St. Peter’s Square. The delegation included Luis Enrique Zayas, gold medalist at the World Under-20 Championships in the high jump in 2016, and coach Barbaro Diaz Castro. Sotomayor is the only person to ever have cleared 8 feet in the high jump with his world record jump of 8 feet 1/2 inch (2.45 meters) set in 1993. Considered the best high jumper of all time, he has set many records and won numerous records throughout his nearly 20-year career. He took the gold medal in the 1992 Olympics and silver in 2000 before retiring the next year. Cuba boycotted the 1984 and 1988 Summer Olympic Games.